information below or download as a pdf here. 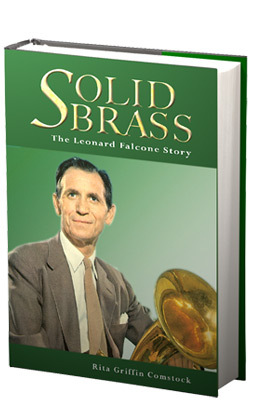 Solid Brass is the story of Leonard Falcone, whose journey to America from Italy through Ellis Island at age 16 led to one of the most unlikely and inspirational careers in the history of the American band movement. 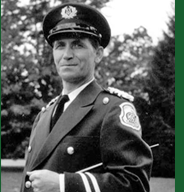 Universally recognized as the greatest euphonium virtuoso of the 20th century, Falcone was Director of Bands at Michigan State University for 40 years, and through his leadership, discipline and musicianship, helped to establish a national reputation for the MSU Department of Music and Spartan Marching Band. This beautifully illustrated 398 page book will be published in September. Rita Comstock’s insightful biography chronicles Falcone’s remarkable life, including his early years growing up in culturally rich Roseto Valfortore, Italy, his success as a silent movie theater musician, the music department challenges during the depression and war years, the two Rose Bowl trips via private rail car courtesy of Oldsmobile, performing with the Michigan State Band for four sitting United States presidents, and his special relationship with Blue Lake Fine Arts Camp, where he would spend his final summers conducting and working with young students. Through it all, Leonard Falcone’s greatest legacy was the example he set as a man of honesty and integrity, who valued his family, his adopted country, and the importance of striving for excellence. His sense of humor and humble approach to leadership inspired thousands of student musicians, many of whom have become renowned performers, teachers and band leaders in their own right. An alumna of Falcone’s Michigan State Band, Rita Comstock offers a fascinating look at Falcone’s professional and personal life. Drawing on hundreds of interviews from those who knew him best, she offers a story every bit as entertaining and inspiring as a Spartan Marching Band performance. Priced at $24.95, the hardcover book will be available online at bluelakepress.org or in stores. A division of Blue Lake Fine Arts Camp, Blue Lake Press has been established to publish music compositions, arrangements, transcriptions, biographies and instructions materials for the fields of music, theater, art and dance. For more information on Solid Brass special events, to arrange an author interview or request an advance reading copy, please contact contact Bill McFarlin at mcfarlin@bluelake.org or call (800) 221-3796 ext: 210.